Restaurant size ice machine on lower deck. No more worrying about ice! Expanded deck with Glass Railing so you can see right to the lake. Wireless satellite internet 5gig limit. Email use only please. TV in second living room. 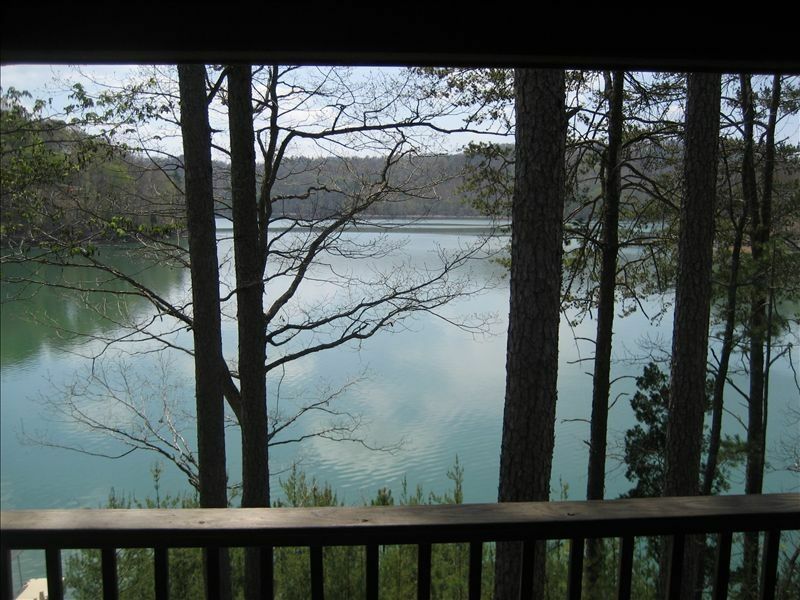 Located on Big Creek with one of the most beautiful views on the lake. The house is built right on the 1044 line. The closest a house can be built on the lake. A short walk on steps to the water and dock with 2 covered slips and a sitting area to enjoy the sun and swiming. 2 covered decks with plenty of outdoor furniture to relax enjoy the views and a gas grill. House features 4 bedrooms, 3 full bathrooms, fully equipped kitchen, dining room, living room, walkout basement, and 4 TV's with Dish Network for those rainy days. The walkout basement has a full bath, laundry and rec room with a poker/game table and electronic dart board. Big Creek is perfect for all water sports including slalom skiing, wake boarding, bare footing, knee boarding and fishing. There is a slalom course within 1 mile. Nearby marinas include Sequoyah, Whitman Hollow, Indian River and Norris Dam. Rentals are available at these marinas for pontoons, run-abouts and personal watercraft. Please call or email us for additional information. We also encourage feedback from our renters. Tell us what you like and do not like so we can make this your ultimate rental experience. A view that can't be beat. The house is very close to and its an easy walk down to the water. The fire pit area is incredible!! Deep year round water great for swimming. Local calls only, please bring calling card for long distance. Satellite Internet. Works great for email but is not fast for downloading large files or streaming video. Good enough to keep you up to date on emails. Best vacation we have been on in a long time! Chris was very helpful and accommodating. There were absolutely no issues whatsoever and Chris even called to make sure we had everything we needed.We will definitely be coming back! Thank you for your awesome review. We really enjoyed having you and hope to you can stay with us again!! Everything about the property was better than advertised! Nothing but relaxation and fun! The owner, Chris, was a pleasure to deal with. He was more than accommodating to all requests. The pontoon boat was awesome, very large and in exceptional shape...big bang for the buck! The house was the cleanest rental I've ever seen, so many small details that made our stay enjoyable. Ice maker on the deck...huge convenience! The only thing that would make this house perfect...shot glasses. Next time I'll bring my own but I'm sure Chris will go buy some when he sees this. Thank you for your review. We are so glad you had a great time and hope to see you again soon!! We enjoyed our stay at Bosley's Bungalow. The house accommodates many guests and is well equipped with kitchen essentials, linens, laundry and kitchen cleaners, plastic/paper goods, etc. We rented the pontoon and enjoyed that along with the boat dock for sunning and swimming. It was great to have the commercial ice maker so that we didn't have to make trips for ice. We loved the fire pit overlooking the lake, and appreciated having wood available to burn (along with skewers to roast hot dogs and marshmallows). Chris was very helpful, providing instructions for the boat, and offering to help with anything we needed. We had 3 generations of family members there and we were all very comfortable and loved this property. It was not too far off the highway and easy to get to. We definitely recommend this property and would love to stay again. Thank You Stephanie for the great review. We were so happy you guys had such a great time. Hope to have you stay again soon. Great home to rent. The owners are next door and everything was very clean and cared for. The place has everything provided. Great eating area on the back deck that overlooks the lake and dock area. Two large frig and large ice machine on back deck. Plenty of car and trailer parking. The location on the lake was great and had many good places for ski and board runs. There was a ski course close by as well. We would go back and had a great stay. It was great meeting you and we are so glad you had a great time. Come back and see us. We rented this Norris Lake house to spend some time away to reconnect as a family. There were 9 in our group, with 2 more that came for a couple days, and we had plenty of space for everyone. The beds were so comfortable with lots of pillows! The limited wifi & no cell service at the house was a welcome addition. (walk a few blocks up the street for a cell signal). Chris & Janine have set up a beautiful retreat. The location on the lake is prime. The kitchen was fully equipped with attention to detail. We were able to set up our boat on their dock, bring out the floats to soak in the lake, while others enjoyed skiing & tubing in the limited boat traffic . Beautiful view from the fire pit for late night s'mores. An outdoor ice machine and a couple of kayaks were a nice addition. The young adults in our group loved kayaking. There's a bookshelf in the basement fully loaded with a board games for the couple of rainy days. They truly thought of everything and we hope to return someday soon. Thank you for sharing your beautiful lake home! Property was great & the owners were helpful. The house was very comfortable we were really happy the AC kept the place cool. I have been in some rentals where the upstairs gets a little warm cause the AC can't handle it but that was not the case here. Love the ice maker!! Only recommendation would be to have an umbrella you can use on the dock. Thank you for the great review. Glad you had a great time. We will work on getting that umbrella for the dock.